Sitakund Girls School defeats P.H. Amin Academy and becomes champion at the final round of Coastal Kids Debate Competition 2013 organized by YPSA on 3rd October at Chittagong Police Institution Auditorium. Topic of the final round was “Climate Change is the responsible for tidal flooding at Chittagong city”. Mr. M. Nasirul Haque, City Editor of Daily Suprobhat Bangladesh was present as chief guest and Mr. Palash Chowdhury, Director (Finance) of YPSA, Md. Jahangir Alam, Head Master of Sitakund Girls School were present as special guest in the final round. Md. Akhter Hossain, Head Master of Chittagong Police Institution presided the final prize distribution ceremony. Md. Syed Assraf Ullah , Program officer of YPSA moderate the program. In the debate competition final 3 judges Mr. Subir Das, Prabal Barua and Adv. Tanvir Zaman played a major role for program successful Coastal Kids Debate Competition 2013. Captain of Sitakund Girls School Ms. AsfiaTahsin selected the best debater in all the three rounds of coastal kids debate completion. 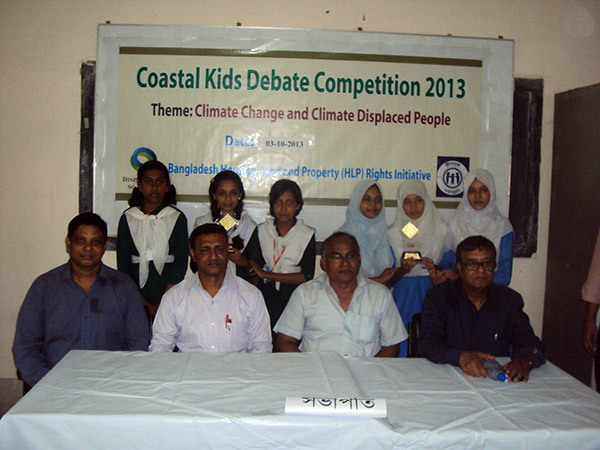 There are 8 schools have been participated in the Coastal Kids debate competition and these are CDA Public School and College, Halishahar PH Amin Academy, Saint Plasid High School, Chittagong POlcie Institutions, Sitakund Girls School, Sitakund Govt. Adarsha School, Mirarsarai Pailot High School and Mirarshari Sarkerhat High School. Theme of the debate completion is “Climate Change and Climate Displaced People”. YPSA arranged Coastal Kids debate competition with the support of Displacement Solution that was started from Sitakund Upazila on 29th September and first session of the debate completion was held at Sitakund Girls School between Sitakunda Govt.AdarshaSchool andSitakundGirlsSchool. Students from class 6-8 from every schools participated the competition. Syed AssraafUllah, Program Officer of YPSA moderated the debate completion and he explained the reasons and theme of the program. Shah Sultan Shamim, Station Manager of Radio SagarGirin and Program Officer of YPSA HRDC welcome all the participants, school teachers for attend the debate program and thanks to teachers of Sitakund Girls School for support to arrange this debate.SitakundGirlsSchool. Md. DidarulAlam , Head Master of Sitakund Girls School opened the debate completion by wishing good luck of the program and thanks YPSA for arrange the informative and modern theme climate change issue selection as the debate program. After the 30 minutes debating on the topic of “Forestry is the main weapon for protection against climate change” for the win between two schools, Sitakund Girls School won the first session of the debate program and their leader Asfia Tahsin selected the best debater in the session. The second session of the debate completion was held on Mirsharai Pailot High School between Sarkarhat N.R. Hat High School and MirsharaiPailot School. Mr. Mahiuddin Khan, Head Master of MirsharaiPailot School opened the debate completion in the MirsharaiUpazila. The subject of the debate session selected as “Human is the main responsible for climate change impact” and lastly MirsharaiPailot High School become the wining team of the debate and best debater award goes to Munjila Tsnim ( Jerin). After the launching the first semifinal between Mirsharai Pailot High School and Sitakund Girls School started on the topic “Not by Public participation, only government attempt playing major role for climate change adaptation”. In this session, Sitakund Girls High School is for the motion team and they moved to the final of coastal debate competition 2013 which will be held on 3rd October at Chittagong Police Institution. From the 1st October, debate competition at Chittagong city has been started at Chittagong Police Institution and Md. Akhter Hossain, Head Master of the school opened the tournament. CDA Public School and Halishahar PH Amin Academy moved into the semifinal round by winning their first round. In the semifinal round issue of the debate competition was ““ Not by Public participation, only government attempt playing major role for climate change adaptation”. In the session, Halishahar PH Amin Academy is for the motion team and they moved to the final of coastal debate competition 2013. YPSA has arranged the orientation program for all the participated school for preparation of debate competition. In the orientation program YPSA hand over the handout of climate change issue related necessary documents and power point presentation of global and Bangladesh perspective climate change scenarios. At that time rule and introductory speech of all the subject of debate competition have been briefly described.